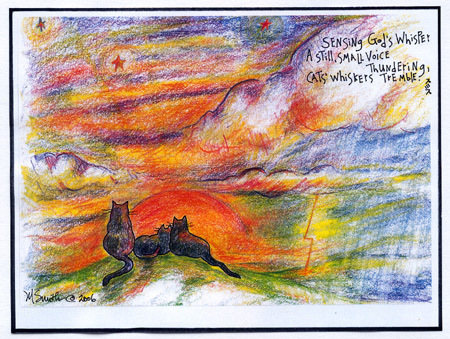 The third of three related cat haiku pieces, inspired by the "still, small voice" of God described in the Book of Job. 11 inch x 17 inch print signed by Mary; open edition. Not So Crazy Cat Lady Series 1:"Every Kitty Needs A Not-So-Crazy Cat Lady"
Not So Crazy Cat Lady Series 2: "Every Not So Crazy Cat Lady Needs a Miracle...or Three"